Preheat oven to 325°F and grease or parchment paper a 8x8 pan. Set aside. In glass mixing bowl melt butter in microwave on full power. Stir in chocolate and mix until combined (a few additional seconds in the microwave may be needed). Add sugar to chocolate/butter mixture until combined. Heat for an additional 30 seconds on high, remove and stir until it looks shiny. It will still look a bit grainy. Add marscapone, vanilla, eggs and mixing until smooth. Sift flour, salt and cocoa into mixture with a sieve and stir just until combined, making sure to scrape all sides of the bowl. (Mixture will be rather light in texture, instead of dense and heavy like many brownie batters). Pour batter into prepared pan and smooth top to ensure even baking. Bake for 40-50 minutes until tester comes out clean. Use the flat end of a potato masher to lightly tamp down the surface of the brownies while they are still warm. Do not squish, merely flatten any parts that might have raised more than others (especially the edges). Leave in pan and set on wire rack to cool. 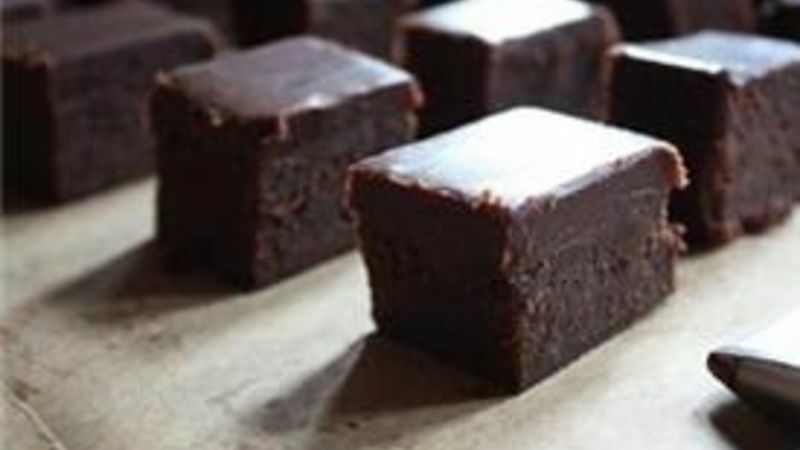 While brownies are cooling, make your ganache to pour over the top. Heat butter and cream on medium power (taking care not to boil) in the microwave and add chocolate. Stir until all lumps disappear. Immediately pour over brownies. Let cool completely. Once chilled a knife will cut through them cleanly.